Our Vision is to improve the quality of education for children in Kamobo, whose parents do not have the financial means to do so otherwise. 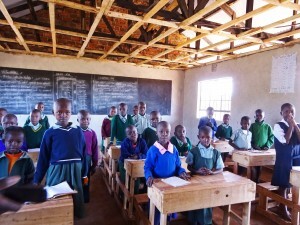 The Kenyan educational system has two different kinds of schools. Private Schools, which are impossible to afford for the majority of the country’s population and public schools, which mostly only provide poor learning environments for the children. Regularly one teacher is responsible for up to 100 kids. It also happens that teachers do not show up for classes for weeks at a time. Another struggle for the children is that they often do not have any access to an affordable lunch, so they are hungry and unfocused in class. The Arbing School Kamobo is trying to counteract all these problems. We provide Pre-Primary and primary school, both of which have two meals included every day. It also provides health care for the children through an on campus nurse. The Arbing School Kamobo does require a small fee, to highlight the worth of education. If it is impossible for a family to meet these fee requirements, the school’s social worker will assess the situation and if needed, will grant an exemption regarding the fees for the family. The Arbing School Kamobo is a charity school and our vision is to assist needy children who pay a small fee and get quality education. Together with our 120 members, we can provide around 300 people with a school education and a workplace. By 2018 we will have completed the construction of sixteen classrooms, an office and a library. A water cistern was built on school grounds, which provides fresh water for the kids and the staff. To provide quality education, we regularly try to improve the classes by acquiring new materials for the classes, such as necessary books. The children enjoy going to school. We added to this fun by building a small sand playground and a school garden, which also teaches them skills that will help them later in life. Did you know that with only 15€ you can support one child for a whole month? When was the last time you spent 15€? You can donate online now or get to know our program better right here!